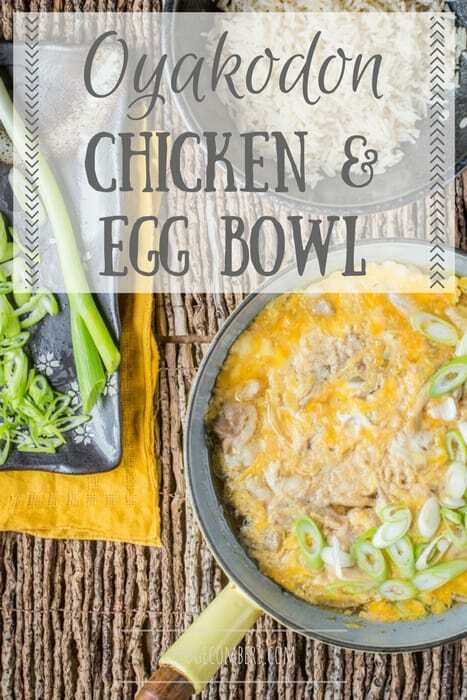 This Oyakodon Japanese Chicken and Egg Bowl is a dreamy blend of sweet and salty, omelette and broth. 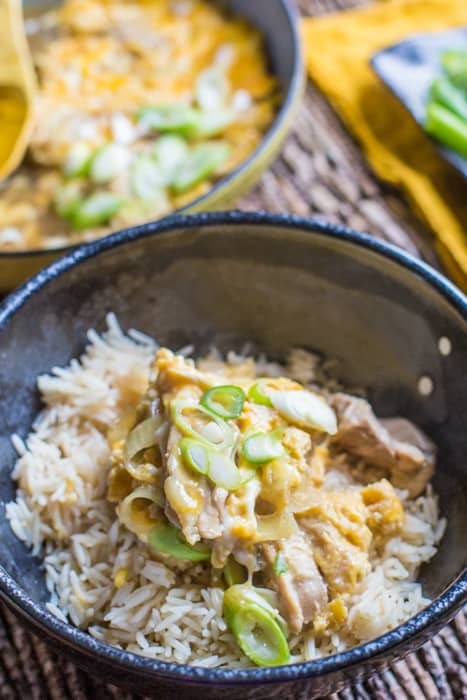 It’s a wonderful dish for those that pine for the authentic flavour of Japan. I spent three months working in Yokohama, Japan during my backpacking years. The two things that I remember most about the country was the beautiful, poetic language and the food. In fact looking back I would say that that trip was the start of my foodie journey. My first night in Japan I was taken to a restaurant by my employer. Neither of us spoke the others language so it was an evening of phrase books and conversation peppered with hands gestures. At this point I’d been vegetarian for 8 years but had decided to start eating fish as I was fascinated by the thought of sushi. At the end of our meal, my host ordered the house special for us all to share and out came this bowl of raw flesh with a raw egg yolk on top. I tucked in excitedly, naively assuming I was devouring sashimi. It was delicious. After we’d finished I got out the phrase book to find out exactly which fish we’d just had. My boss laughed, took the book from me and pointed to the word cow. And that my friends was the end of my days as a vegetarian, as I’d just eaten Steak Tartare! Onto todays yummy treat. 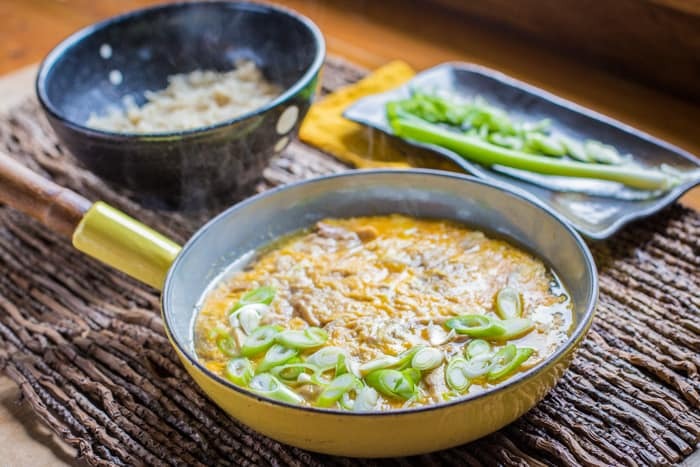 Oyakodon is a bowl meal with a sweet yet savoury omelette, cooked in broth, served over rice. 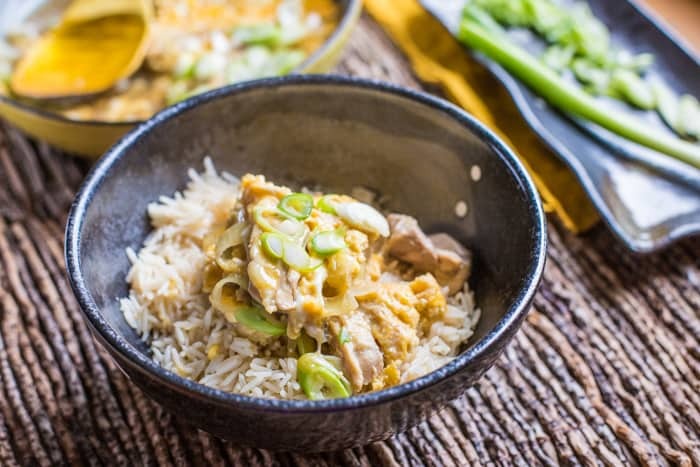 The flavours are unmistakably Japanese and this dish is as nourishing as it is traditional. I do hope you try it when you need a speedy supper. If Japan is top of your foodie bucket list, then keep reading! The rich culture around Japanese food is one you truly need to experience, it’s totally unique. You can catch a smidgen of that culture in this video courtesy of All Nippon Airlines (ANA). It’s one of a series of videos called Ichigo Ichie (one opportunity, one encounter) which urges us to celebrate the current moment, which is especially important when travelling. Fun Facts: ANA is Japan’s only 5 star airline. It flies on 83 international routes, many of which are in Europe. Traditional Japanese cuisine is served on board each flight, and for flights that depart outside of Japan, local chefs are trained in the exacting standards of Japanese cuisine. If you are planning a trip to Japan, do take a look at flying with ANA as your Japanese adventure will start as soon as you board the plane. Heat a large frying pan and add the mirin and sake. bring to a boil. Add dashi, soy sauce and sugar, and bring back the the boil. Lay the onion out in a single layer and place the chicken on top. Cover nad bring to a boil. Skim off any scum or fat then reduce the heat and let simmer for 10 minutes. Slowly drizzle the beaten egg around the pan and cook gently until the egg is cooked through. Shake the pan occasionally to prevent it sticking. 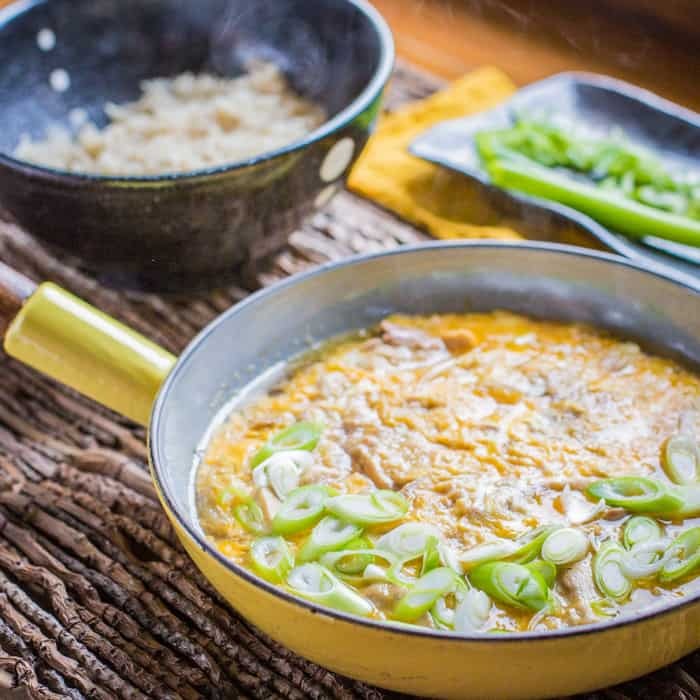 Sprinkle the spring onion then pour the omelette over the hot, cooked rice. Add as much broth as you like. Recipe courtesy of Namiko Chen. Huge thanks to ANA for sponsoring this post thereby allowing me to continue bringing you tasty recipes, for free. As always all thoughts (and leftovers!) are my own.